Once you start making shakshuka, you’ll see how adaptable it is to whatever garnishes you have on hand. I love to use labneh because it's always at the ready in my refrigerator, but feta cheese and olives also make it great. 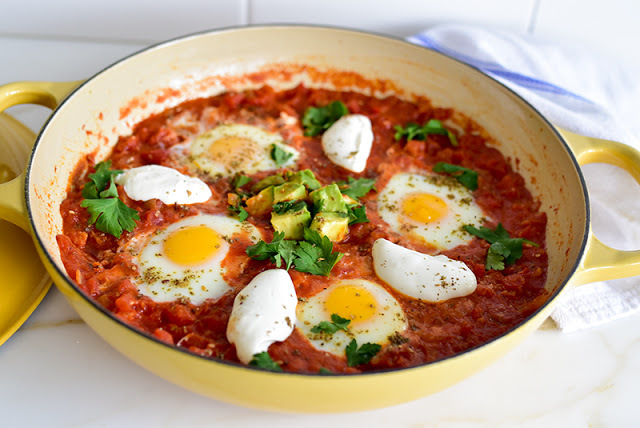 Even with no garnishes at all, shakshuka saves the day. My thanks to Molly Yeh for teaching me all things shakshuka. 1. Heat the olive oil in a medium frying pan over medium heat. Add the onion and a pinch of salt, cooking until the onions are soft and translucent but not browned. 2. 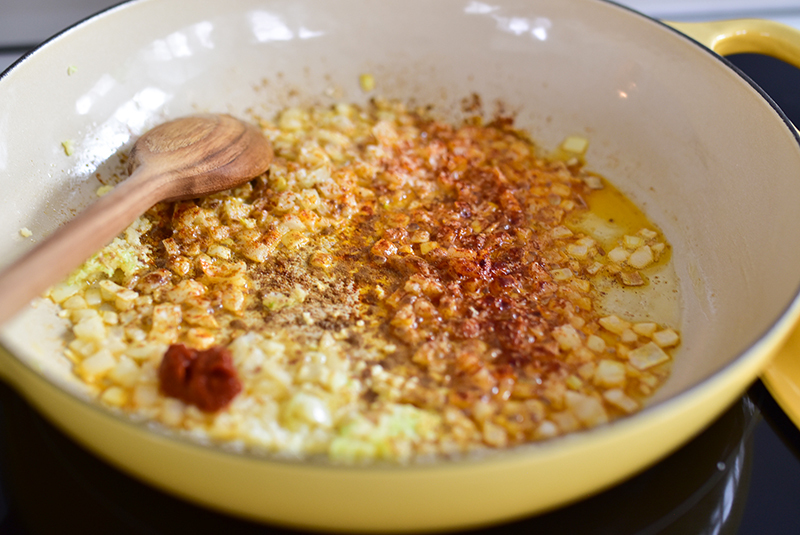 Stir in the harissa or red pepper flakes if using, coriander, paprika, garlic powder and fresh garlic, stirring just until fragrant, about a minute. 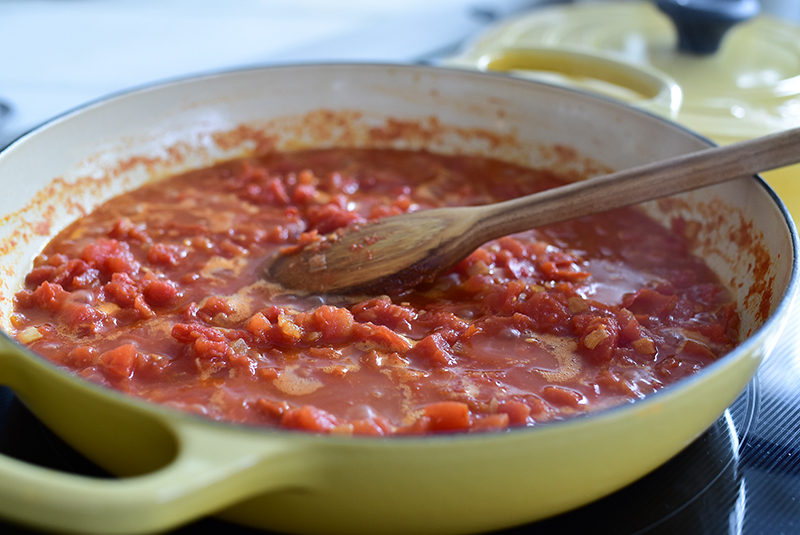 Add the tomatoes and sugar and cook until warmed through. 3. To poach the eggs, crack each one individually into a little bowl (easier to get the shell out if needed) and add them one at a time. I like to crack eggs on a paper towel, then slip them into the bowl, to keep from getting egg all over the counter. 4. Make a divot in the tomatoes with the back of a large spoon to make a spot for the egg, and pour the egg in from the bowl. Do this for each of the four eggs. 5. The eggs will cook through in the tomatoes with a sunny-side-up look (but the longer they’re in there, the more cooked through the yolks will be). Or, put a lid on the pan and cook the eggs more swiftly to your desired doneness. 6. Before serving, top the shakshuka with diced avocado and dollops of labneh. Dust with za’atar and finish with fresh herbs. Scoop the two eggs with tomatoes into each of two bowls to serve.